We knew from informal feedback on the day that most visitors – and we had 1,500 through the doors - felt it had been a valuable event, so it’s fantastic to have official confirmation through the responses to our questionnaire. Our aim was specifically to provide networking opportunities for smaller businesses so it was good to see that 50% of those attending were Small and Medium-sized Enterprises (SMEs), and that there were dozens of delegates who were new to the decommissioning market. Equally useful, we now have a range of suggestions for further improvements that will help to shape how we organise the programme next year. The informal networking and face-to-face discussions are of huge importance for our suppliers so we’ll be aim to enhance this aspect. Those I spoke with also seemed to really value this as an event that is organised by the industry for the industry. The 6th #DecommSupply event at Manchester's EventCity in November was part of a series of initiatives we've developed over recent years to support the supply chain. There was a real "buzz" on the day, and it was definitely the busiest event we've had so far, attracting well over 1,500 visitors. We know that suppliers value the opportunities for networking with other businesses, as well as hearing from and speaking directly to leading figures from across our estate. So this day is a welcome part of business calendars. Those I spoke with really seemed to value this as an event that is organised by the industry for the industry. The reason this event is so important is that the success of our 120 year mission, to clean up 17 of the UK's earliest nuclear sites, relies on vibrant, dynamic businesses finding solutions to the many challenges across our estate. So far, 3000 companies have worked with us to achieve our mission. Two thirds of these are SMEs. 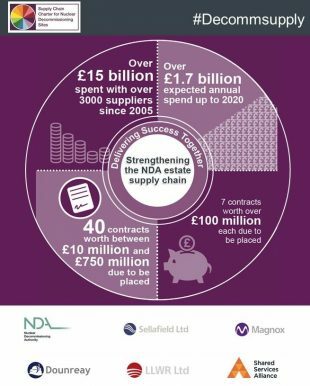 This event is about working with the supply chain, from the largest to the smallest players, to improve opportunities for involvement in decommissioning. 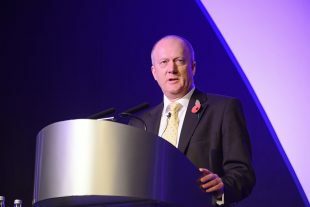 NDA Chief Executive, John Clarke, formally opened the #DecommSupply event, highlighting the importance of suppliers in providing skills and innovation to support decommissioning progress. The main hall featured almost 300 exhibition stands, staffed by a wide range of technical and service suppliers, alongside information stands representing the NDA, all the SLCs, government bodies and regeneration organisations. Additional afternoon sessions also worked well, offering presentations on specific subject of interest, such as collaborative procurement, R&D or skills. 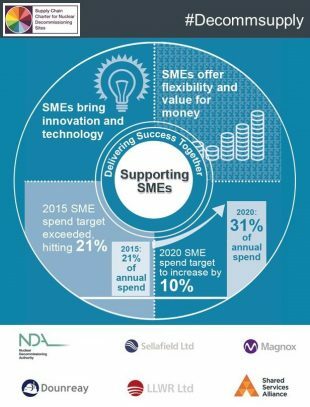 Co-ordinated jointly by the NDA and its Site Licence Companies, the day aims to provide greater visibility of opportunities for suppliers, in particular for SMEs. We had a stand at the event dedicated to information specifically for SMEs. We had a stand at the event dedicated to useful information specifically for SMEs. We welcomed representatives from businesses across the UK and overseas. Some delegates came from as far afield as Canada, the US, Japan, India, Singapore and Europe. 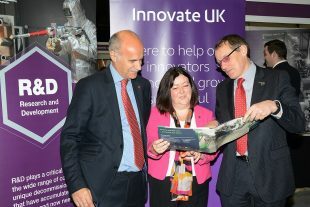 The ever-popular Innovation Zone, supported by the government’s Innovate UK, hosted more than 40 exhibitor companies. They demonstrated their leading-edge technologies during the afternoon. One of the morning highlights was the presentation of NDA Estate awards which recognise suppliers who have successfully worked on collaborative projects, innovative technology, skills development and exports. To share news and views with colleagues across the industry, we encourage suppliers to join our LinkedIn supply chain group. We currently have nearly 900 members. Estoy muy de acuerdo en la propuesta de NDA de trabajar hasta encontrar solución definitiva para la Disposición de combustibles gastados de alta actividad y el desmantelamiento de instalaciones nucleares que cumplieron su ciclo. I strongly agree with the NDA's proposal to work until it finds a definitive solution for the Disposal of high activity spent fuels and the dismantling of nuclear facilities that have completed their cycle. Gracias por compartir sus opiniones. El programa Parcial de saneamiento de 17 instalaciones nucleares mas antiguas de RU es una necesidad y una obligacion de GOV. UK. La construccion de un Repositorio Geologico Profundo Internacional es una Solucion Definitiva para el RU y para otro paises que no saben o pueden resolver esa problematica nuclear. Por ello es que Cumbres SA solicita hacer contacto con Sellafield Ltd para presentarle una vision general del Programa Integral de Desmantelamiento Nuclear. The Partial sanitation program of 17 oldest nuclear facilities in the UK is a necessity and a GOV obligation. UK. The construction of an International Deep Geological Repository is a Definitive Solution for the UK and for other countries that do not know or can solve that nuclear problem. That is why Cumbres SA requests to contact Sellafield Ltd to present a general vision of the Comprehensive Program for Nuclear Dismantling.